15mm printed chevron FOE hot pink/acid green Fold over elastic is a soft and stretchy elastic perfect for making headbands and hair ties. It is also used as a bra and underware elastic. This elastic can also be used for sewing on garments. We sell a huge range of solid coloured fold over elastic -FOE here at Think Bowtique. Our fold over elastic is made from combination of nylon and spandex. 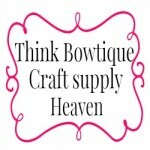 Think Bowtique is your #1 source for headband elastic in Australia.